This book contains a large amount of information not found in standard textbooks. 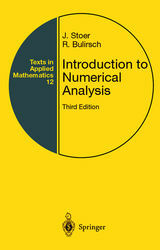 Written for the advanced undergraduate/beginning graduate student, it combines the modern mathematical standards of numerical analysis with an understanding of the needs of the computer scientist working on practical applications. Among its many particular features are: fully worked-out examples; many carefully selected and formulated problems; fast Fourier transform methods; a thorough discussion of some important minimization methods; solution of stiff or implicit ordinary differential equations and of differential algebraic systems; modern shooting techniques for solving two-point boundary value problems; and basics of multigrid methods. This new edition features expanded presentation of Hermite interpolation and B-splines, with a new section on multi-resolution methods and B-splines. New material on differential equations and the iterative solution of linear equations include: solving differential equations in the presence of discontinuities whose locations are not known at the outset; techniques for sensitivity analyses of differential equations dependent on additional parameters; new advanced techniques in multiple shooting; and Krylov space methods for non-symmetric systems of linear equations.